As usual it is raining, but sometimes there is nothing better than just accepting that in Britain it is wet a lot. 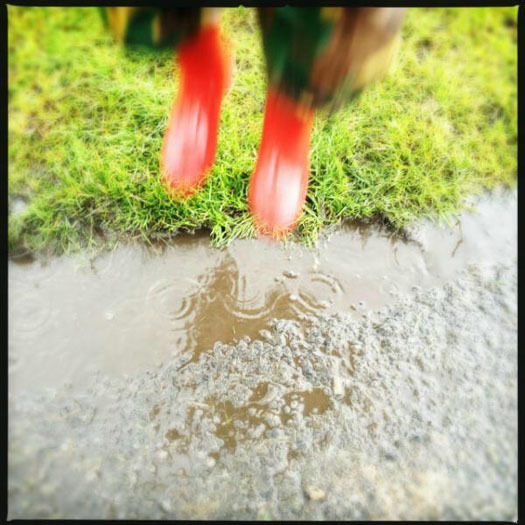 So here is our guide to puddle jumping. Let’s start the competition, who can make the biggest splash? Get the wettest? On a wet day, why fight it? Sometimes you just can’t beat the weather, and on those days you might as well just get stuck in. A good tip is to get waterproofs that cover the whole body. Even better, but more expensive, are made from breathable materials that don’t suffer condensation. Cover the whole body and make sure you don’t tuck the trousers into the wellies, but put them over the top, so the water runs down and over the boots, not into them. Finally, a peaked cap is really useful to stop water running into the face. A good supplier we have used for waterproofs for children is Muddy Puddles. Then go running around in the rain, and if you are brave enough, who dares to roll in the biggest puddle? Good tip for this activity – have towels, spare clothes, hot Ribena and snacks for afterwards.